Kris Kobach is charged with investigating Federal elections, yet he LIES about the 2016 results. Our #fakepresident got slightly fewer than 63 million votes. The other candidates got more than 74 million votes, including the nearly 66 million who voted for the winner, Hillary Clinton. Why aren’t the millions who voted for Johnson, Stein, or McMullin outraged at being ignored? Hillary Clinton definitely won the popular vote, and that lead is only going to grow. Turnout in the 2016 election was not low. It is about the same as it was in 2012 and comparable to most 20th-century presidential elections. Yes, the polls were off, but not in extraordinary ways. 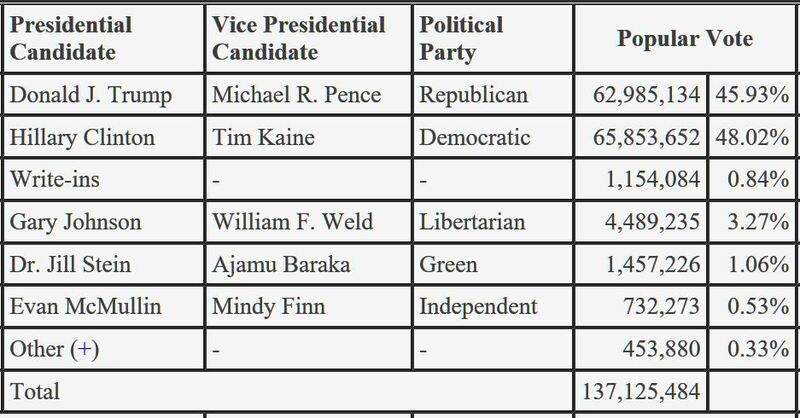 Third-party candidates, like Gary Johnson and Jill Stein, may have cost Mrs. Clinton Michigan, but they almost certainly did not cost her the presidency. Exit polls are useful, but don’t give them too much credence. Details at the link above. The format for the third debate will be identical to the first presidential debate. The … debate will be divided into six time segments of approximately 15 minutes each on major topics to be selected by the moderator and announced at least one week before the debate. The moderator will open each segment with a question, after which each candidate will have two minutes to respond. Candidates will then have an opportunity to respond to each other. The moderator will use the balance of the time in the segment for a deeper discussion of the topic. The Vice Presidential debate will be divided into nine time segments of approximately 10 minutes each. The moderator will ask an opening question, after which each candidate will have two minutes to respond. The moderator will use the balance of the time in the segment for a deeper discussion of the topic.